I'm excited to hear about your trip to San Diego. It seems like a easy, ideal destination for families traveling with babies and toddlers. For starters, the weather is near perfect for little ones - mild, with little precipitation throughout the year. Exactly. Plus, it's an incredibly safe destination. And although this isn't an issue for us at the moment, for many parents looking to grow their family it can be - San Diego hasn't reported any local transmissions of the Zika virus. So, you get the relaxing, beach vibe without some of the risks of other vacation destinations. Another plus is that the airport is really close to downtown. And we never found ourselves stuck in traffic during our trip (although we did always avoid driving during rush hour). Moonlight Beach in Encinitas, California gets parents' seal of approval for its baby and toddler friendliness. Tell me more about your San Diego area vacation with your one year old. Where did you stay? We stayed in three different spots throughout our stay. First we drove to Encinitas, which is a little beach village about half an hour north of San Diego. For me, that was the highlight of the trip. Encinitas has one main strip with shops, restaurants, bars and coffee shops - and it's just a very relaxed vibe. I loved Moonlight Beach, which is just a few blocks from Main Street. It was just super family friendly - beautiful sandy beach with tons of other families there, a nice shaded playground, clean restrooms, outdoor showers ... it may sound lame that this is the highlight, but it was just really easy, which is what you want with a one-year-old. It was a short walk with our wagon of beach gear from our AirBNB rental. If you're not going to stay at a resort, being walking distance onto the beach is the next best thing. Not lame, I totally get it. What made you decide to stay in a home rental? There aren't really any hotels in Encinitas, and having a home rental with a separate bedroom for the baby is very appealing - even if he does come into bed with us before morning. (Editor's note: Though there are no resorts in Encinitas, there are a few 2 and 3 star economy hotels in Encinitas. However, if traveling with a baby or toddler, The Littlest Passport recommends searching for a home rental close to Moonlight Beach). How long did you stay in Encinitas? We stayed three nights. I could have spent a week! If you really wanted to relax and get into the pace of life there, I think a week would be great. Also, it's close enough to San Diego that you make it a home base and drive to the La Jolla tide pools, or the San Diego Zoo. Lego Land is actually north of Encinitas in Carlsbad (about 20 minutes). All would be great activities with little ones and older kids. The Flower Fields in Carlsbad are a great spring outing if visiting Encinitas in the spring - babies and toddlers will love the antique tractor ride through the colorful flower fields. What non-beach activities would you recommend with a one-year-old in and around Encinitas? If you visit Encinitas in the spring, the Flower Fields in Carlsbad are a beautiful outing - it's 50 acres of colorful ranunculus flower fields in bloom. We opted to explore the fields on the antique tractor ride, which Reuben loved! We also visited the San Diego Botanic Garden in Encinitas. It was terrific and they had a great kid's area, where kids can play in and around beautiful trees and gardens. Any recommendations for great restaurants or cafes in Encinitas? For coffee, we really liked Ironsmith Coffee Roasters. Also, there was an awesome grocery store close by as well - Lazy Acres. Whole Foods style, but even nicer. We ended up getting a bunch of prepared meals there. 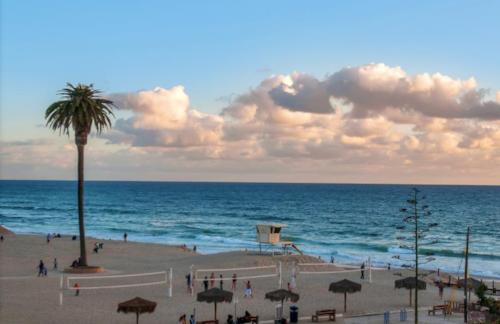 Editor's Note: For more ideas of things to do with a toddler in Encinitas, read a parent-written itinerary for Encinitas on Nugget. The San Diego Botanic Garden in Encinitas, California is a great place to visit with babies and toddlers, and includes a kid's play area to climb and explore. Where did you stay after Encinitas? We went to the San Jacinto Mountains region, around Idyllwild, California. I wouldn't necessarily recommend the town itself, but our AirBNB was really nice, quiet and secluded. There are some nice state parks in the area for short hikes and picnics, some little towns with cool restaurants - all very family friendly. It's worth noting that the San Jacinto Mountain area is actually quite close to Palm Springs, for families considering a vacation there. Then we stayed at the Loews Coronado Bay Resort back in the San Diego with my parents. I liked Coronado because it is a bit isolated from the rest of San Diego, and made it feel a bit more relaxing (somewhere in the middle of a resort vacation and a city vacation). Loews' Coronado Bay View King Suite has a living room and balcony. Booking a suite and standard room worked well for traveling with a baby and grandparents. What room type did you stay in at Loews Coronado Bay Resort? Did it suit your family's needs with a baby? Yes, it did. Actually, the room configurations worked out nicely for multiple families traveling together. We met up with my parents at Loews Coronado Bay Resort, and we got two rooms side by side. One was the Coronado Bay View King Suite, which had a living room, and the adjoining room was a standard Coronado Bay View room. This worked out really well. The configuration let us all spend time together and share a living space, while also giving us space to retreat when we needed quiet or alone time, or when Rueben needed to nap. It's worth nothing that there isn't a door adjoining the two rooms, but a fire door in the hallway closes off the two rooms from the rest of the rooms on the hall. This made the two rooms very private, and noise insulated. The rooms had really nice balconies. But in addition, there was a lovely courtyard outside our room - which the balconies overlooked. So, we could sit in the courtyard with the baby monitor on as well. It was nice to not be restricted to only the balcony or the living room while Rueben was asleep. Editor's Note: Loews Coronado Bay provides child proofing kits for families with children under four years old, along with a list of nearby tourist attractions and activities recommended for children, as well as nearby pharmacies and pediatricians. How was the crib at Loews Coronado Bay? We didn't actually use the resort's cribs. On past trips, we had some bad experiences with crib quality - rickety, or unclean - so now we always bring a travel crib with us whenever we vacation. Editor's Note: Loews Coronado Bay does provide full size cribs for parents wanting more than a pack and play. Many parents on travel review sites commented on the high quality of the cribs. 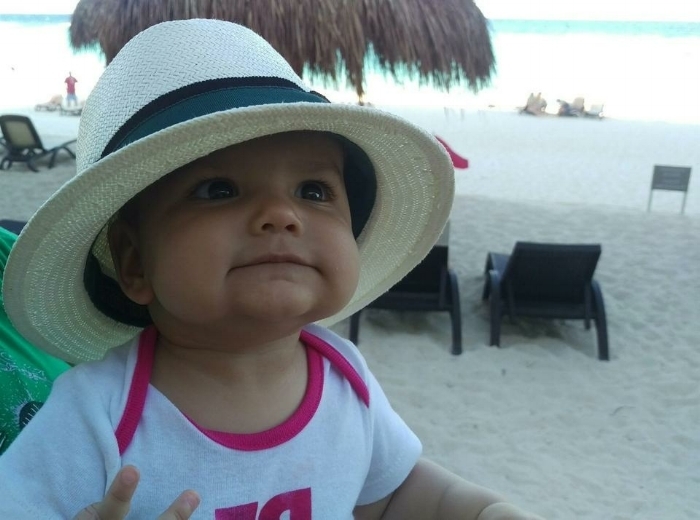 The Littlest Passport recommends always reaching out to hotel management prior to arrival to request required amenities such as cribs, and to ensure availability. Does Loews Coronado Bay have many baby-friendly resort activities? Rueben is obsessed with swimming - he will jump into a pool and stay in until he's purple and shaking. 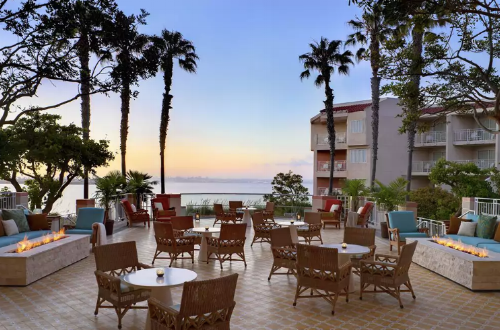 Loews Coronado Bay has three large heated pools - including a family pool, and close to the pools there is a deck with a giant chess board, an oversized Connect 4 game and ping pong tables. Reuben loves balls, so he spent a bunch of time happily chasing them around. (Editor's note: Loews Coronado Bay Resort does not have a wading pool. Of its three pools, one is a children's pool - aimed at slightly older kids as the depth is 3 and a 1/2 feet around the edges - another a family pool, and the third is adults only). We would wake in the morning, order room service for breakfast, and then head out to the pool for a couple of hours until his nap time around 11am. He was completely contented. Is there a Kid's Club at Loews Coronado Bay Resort? No, there isn't a traditional "Kid's Club" where children can be dropped off and entertained, although there are kids' activities in the summer time. Editor's Note: Loews Coronado Bay Resort's Summer 2018 Kid's Activity schedule can be accessed here. Activities are complimentary, and under 4's can participate with adult supervision. The majority of activities take place late afternoon and evening Friday-Sunday and are aimed at slightly older children, although the bubble station (12-1pm Tuesday, Thursday and Sunday) is sure to be a hit with the baby and toddler set. It's worth noting that the hotel hosts games and activities at the pools from 12-3pm every day in the summer, so if you're traveling with a napper, you may want to request a hotel room away from the pools - and if you're looking for some quiet pool time while your little one naps, you may be disappointed. Did you use a babysitter while at Loews Coronado Bay? We didn't, although the resort will provide a list of bonded babysitter services. My husband works a lot and doesn't get to see our little one as much as he'd like, so vacation time is family time. What would you and Brian do while Rueben napped? The hotel offers a complimentary shuttle from the hotel into the town of Coronado. One of us would stay with Rueben while the other one went into town. There was a grocery store in town so we could pick up some food and snacks, without having to take the car and find parking. So that was nice and super easy. Relax after the baby is asleep on your private balcony or on the Loews Coronado Bay Resort terrace. Speaking of food - how was the food at Loews Coronado Bay? The restaurant was family friendly, with a kid's menu and crayons for coloring. But the food wasn't great, including room service. So we would usually order room service for breakfast, and then would go off-resort for other meals, and also just snack a lot in our room. Any particular stand-out restaurants in Coronado that you went to with the baby? We had a really nice meal at Chez Loma. You'd use the pools at Loews Coronado Bay in the morning. What would you do with your one-year-old in the afternoons? One afternoon we went to the San Diego Zoo, which is always a winner with a baby and toddler. Sometimes Brian and I feel uncomfortable at zoos - thinking about the conditions of the animals - but the San Diego Zoo is world class, so we felt good about visiting. Sea lions at the Children's Pool in La Jolla. Although swimming with your baby or toddler at the Children's Pool is discouraged due to the arrival of sea lions and seals, seeing so many of these animals at a close distance is sure to be a hit with little ones. Other days we'd go to the beach. We went over to Hotel del Coronado one afternoon, which I'd highly recommend. It's a beautiful old hotel, with a really calm beach that's perfect for swimming with little ones. Reuben likes to run full speed into the ocean - he has no fear. It can be a little frightening for us, so the Hotel del Coronado's calm beach waters are ideal for our baby. Pool deck at Loews Coronado Bay Resort, which includes a kid's pool, a family pool, and an adults-only pool (though no wading pool for babies and toddlers). Did you make use of the hotel's amenities? Yoga and aerobics classes, fitness center, spa? No, we didn't. Our trip was really about family time and relaxation. Would you say you had a relaxing vacation with your one-year-old in and around San Diego? And any recommendations to families with babies looking to make a trip to San Diego? Driving between destinations worked out OK. But if I was doing it again, I would just visit two locations - it's always a bit of work to pack up and set up at a new location when you have a baby. We could definitely have stayed longer in San Diego and not have felt bored. I'd recommend five days. The San Diego Zoo and the beach at Hotel Del Coronado were highlights of our time in San Diego. Definitely consider a trip out to Encinitas and Moonlight Beach. But plan in advance - somehow I always leave accommodation bookings to the last minute, and this time was no exception. I definitely saw AirBNBs that would have been even nicer for ourselves and our baby, but they weren't available for the dates we visited. San Diego has good transit, although we didn't use it since we took our own pack and play, and were driving around to different destinations. But there are Coaster trains that go up the coast - including to Encinitas - to small towns from San Diego. Oh - and definitely get an AirBNB with laundry if you're spending time on the beach!